Decades after the last man walked on the moon, Apollo astronauts still get a lot of respect. Some of them have been portrayed in Hollywood movies. Many of them willingly, even in their advanced ages, give public lectures and sign autographs. And already, some observers are wondering about the loss to humanity when the last moonwalker dies. 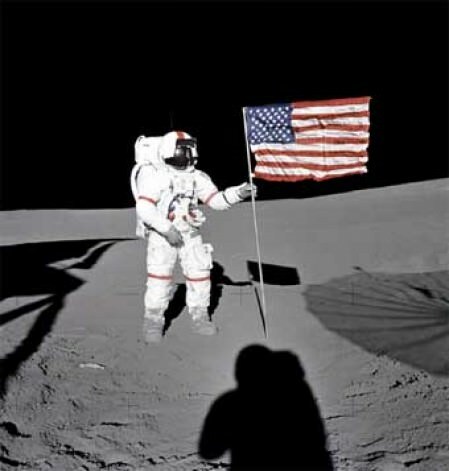 But there is a still a percentage of the population that believes that the astronauts didn’t land on the moon at all. To address this, a couple of experienced hands in filmmaking started a new video series examining and debunking the common conspiracies. Helming the project is Chris Riley, who produced and directed ‘First Orbit’ as well as two BBC biographies of Neil Armstrong and Richard Feynman, and animator Antony Buonomo, who won an Emmy for his work. “This Christmas it will be 45 years since the first astronauts reached lunar orbit, and yet conspiracy theories continue to question if the Moonshots ever really happened,” a press release stated. We’d also be remiss if we didn’t point out Bad Astronomy/Phil Plait’s classic rebuffing of the Apollo conspiracy theories, which he wrote after Fox aired a controversial documentary in 2001. “Of course, I am trying to debunk the conspiracy theorists, but unlike them, I want people to look at their evidence rationally and critically, and not swallow it whole. It’ll choke you if you do,” Plait wrote at the time.